Curcumin, the principal curcuminoid of the popular Indian spice turmeric, is obtained from the ground rhizomes of Curcuma longa L. Curcumin is a hydrophobic polyphenol compound that has been recognized as a naturally occurring yellow pigment and component of the spice turmeric. Several in vitro and in vivo studies confirmed that turmeric extracts and purified curcumin have powerful biological activities, such as anti-inflammatory, hepatoprotective, antiviral, antibacterial, antidepressant, antidiabetic, antitumor, immunomodullatory and gastroprotective properties. In addition, it has been successfully used in the treatment of Alzheimer‘s disease and cardiac disorders. Due to its antioxidant properties, they have been widely accepted as one of the spices with the highest antioxidant activity. The first chapter included in this book aims to show the various studies on the therapeutics actions and toxicity of curcumin. 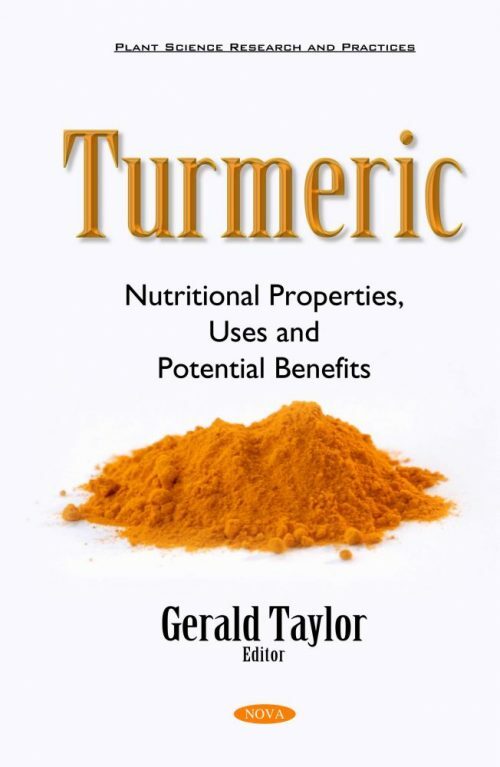 The following chapter explorea the potential effectiveness of turmeric at managing chronic inflammation by examining its molecular effects on the immune system, together with a review of double blind clinical trial data of the phytochemical. It also discusses the safety and quality control issues behind the usages of this herb. Chapter three examines the use of turmeric dye solvent extraction residue for development of bioactive packaging.